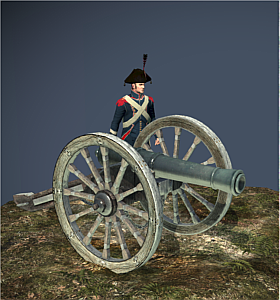 With twice as many guns as an ordinary artillery unit, the Grand Battery is an exceptionally strong unit. Its cannons have both a long range and tremendous killing power. However, it is vulnerable to cavalry attack even when not emplaced, as it is slow moving. The gun crews are only armed with swords and relatively untrained in hand-to-hand combat. Fighting is not their task: serving the guns is their only duty. The Grand Battery was the turning point of Napoleon Bonaparte’s career: he was promoted to brigadier-general thanks to his skills and drive. As a trained artillerist, he knew that the real killing power in an army was in the heavy guns, not musketry or sabres. The idea of a Grand Battery was used in many of his later battles. It relied on weight of fire against a single section of an enemy line to blow a hole through any enemy defences. Against the storm of shot that a grand battery could produce, flesh stood little chance. The best defence was to use a reverse slope and hide behind the crest of a hill, rather than endure such a bombardment.